My eldest turned 11. *sob* It’s crazy to think that she was a baby when I started blogging. Now she’s tall and leggy and bakes independently. And is completely obsessed with Harry Potter. (This phase is WAY better than the Disney Princess black hole. For sure.) We’re throwing her a Harry Potter party tomorrow with a few of her friends, so I’ll show you guys all the fun happenings on my Instagram stories. Also, a podcast I was interviewed on a couple of months ago went live this week. You can find the episode here on the We Get To Know Podcast — a fun new podcast that highlights online influencers. 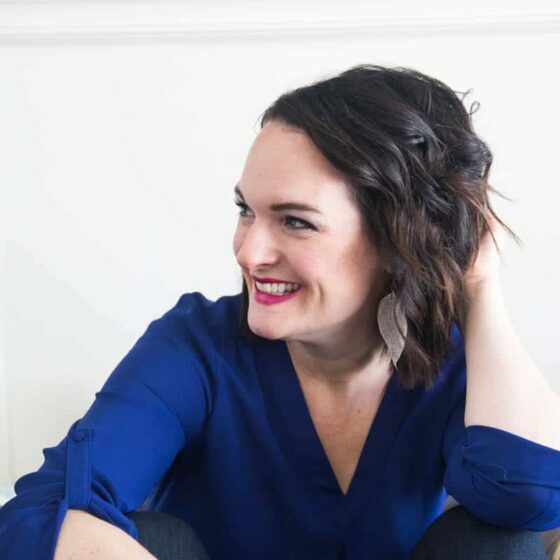 Click over if you want to listen to me talk about random stuff, like trying to get four kids to eat (relatively) healthy, my thoughts on blogging, and my #1 parenting tip. Turns out I giggle quite a bit when I’m nervous. I’ll just hide under my bed now. AND I got my first therapeutic gemstone necklace this week. I’ve entered a new level of hippie, I think. One way I get my kids to eat healthier is by having meals with a lot of components — like salad nights. That way they can put their bowls together exactly how they want. With a little vegetable-prodding from mom if they end up with a bowl full of bacon. Even my kid who doesn’t like salad that much will pretty much eat any salad if it is covered in balsamic vinaigrette. 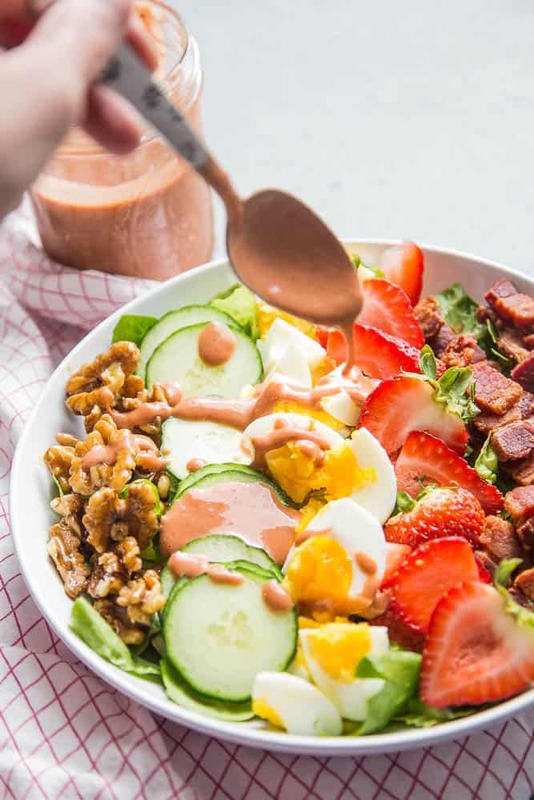 This strawberry cobb salad was a hit with the bacon and candied nuts and strawberry balsamic vinaigrette. 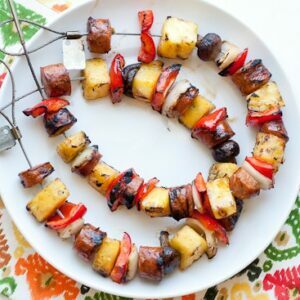 You can easily make it Whole30 friendly by using plain roasted nuts and compliant bacon! 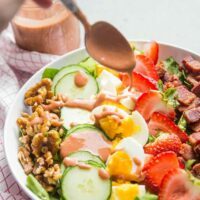 This is a fun twist on a cobb salad with sweet strawberries, toasted walnuts and strawberry-balsamic dressing! 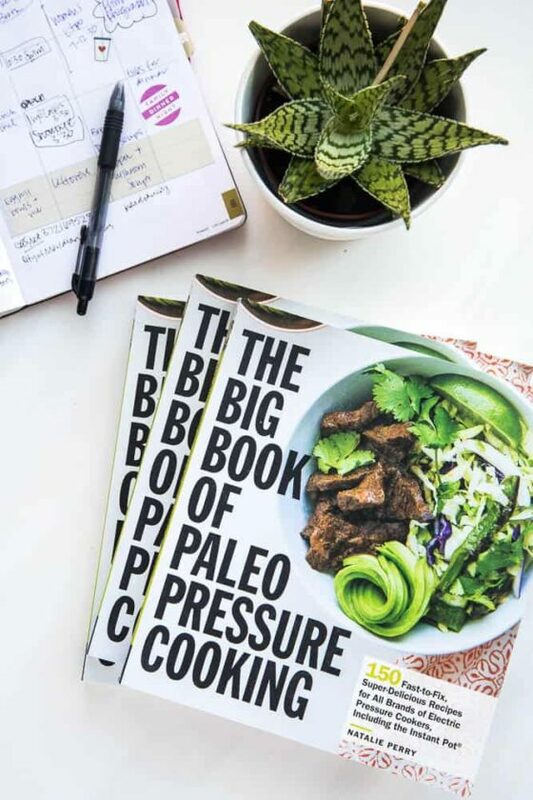 It's paleo and Whole30 friendly, too. Slice the bacon into 1-inch pieces and cook them in a large skillet over medium heat, about 20 minutes, until they reach the desired crispness. Meanwhile, prep the lettuce, eggs, cucumbers. Reserve 4 large strawberries (about 5 ounces) and set aside for the dressing. In another, smaller skillet add the nuts and maple syrup and cook them over medium-low heat until most of the maple has cooked off and the nuts are sticky and fragrant. Transfer them to a bowl or plate to cool and sprinkle with a pinch of sea salt. When the bacon is finished, transfer the bits to a paper towel to soak up any excess grease. 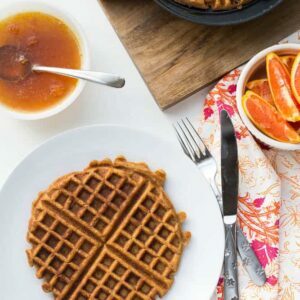 Make the dressing by blending the reserved strawberries, balsamic vinegar, mustard, and sea salt in a blender or food processor until smooth. 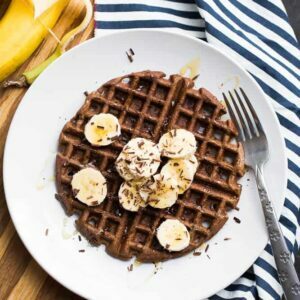 Drizzle in the oil while the machine is running. Taste, and add a little extra salt or maybe a 1/2 teaspoon of honey if your strawberries weren't particularly sweet. Assemble the salads by putting a bed of lettuce in each bowl. 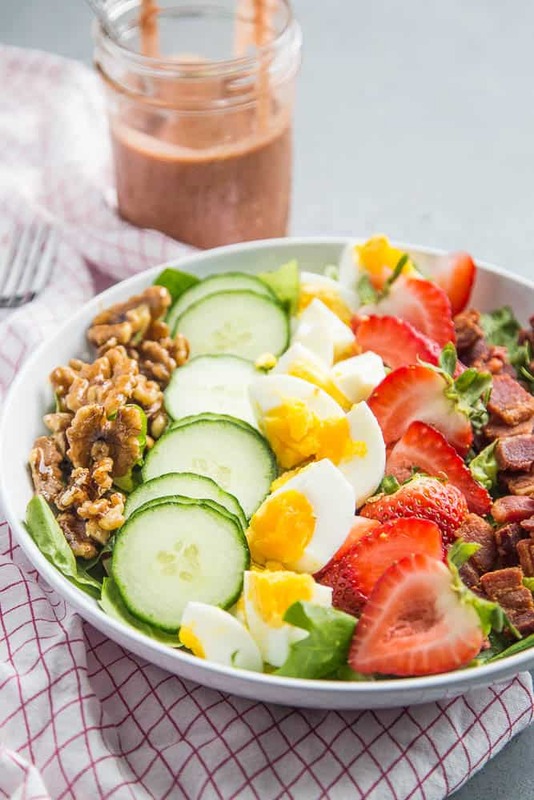 Top with sliced cucumbers, eggs, candied nuts, bacon pieces, and sliced strawberries. Drizzle with dressing.